So sweet. Ooh, how did you do this? One part of the fence is framing her cute little face yet there is fence behind her! Were there 2 fences there or did you do some fancy editing? What a beautiful portrait (and beautiful girl) The pink cap adds real style! She looks so cute 'peeking' through the fence! Awesome how you used the macro lens for the shot...I would never have thought of that...then again what do I know! Beautiful portrait - the eyes are perfect - which makes the shot. karen--I think it's called a macro lens anyway--its the setting with the flower and it does close up to infinity...am I right, is that a macro lens? 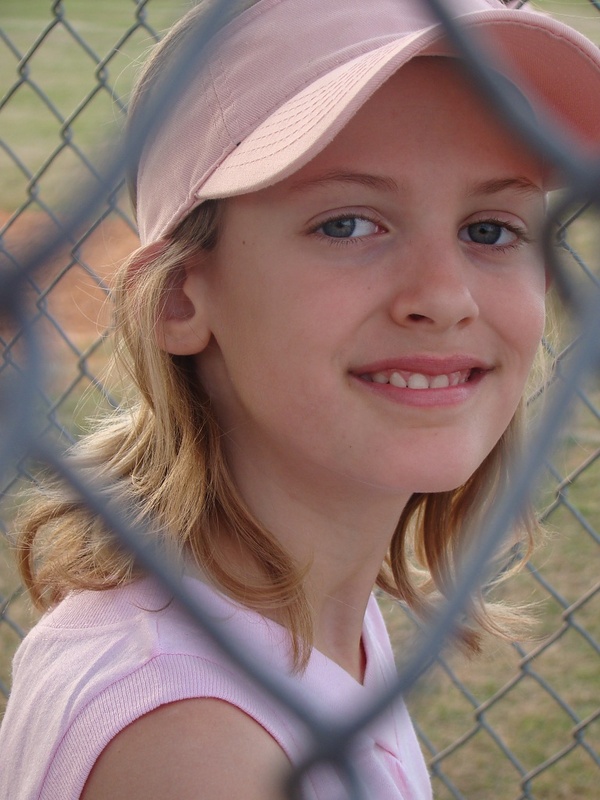 What a sweet photo, and so appropriate, seen through the fence, and she's on the softball team... She's adorable! ...I only learned this myself the other day...SOOC means Straight Out of the Camera. Maybe a little cropping, but no editing in Photoshop, etc. Love how her face is framed. Great shot!